As economies tumble down like dominos and man-made disasters sweep the globe, all the signs spell out an unequivocal message: it’s time to party like there is no tomorrow. Through games so preposterous they might actually turn out prophetic, The Apocalypse Gameshow prepares contestants for a series of end-of-the-world scenarios, equipped with ludicrous satire and enlightened paranoia. Host Dex Sinister (a thinly disguised parallel identity of bohemian accordionist Tom Baker) runs the proceedings with surprising élan for a conspiracy theorist, gently grilling players about their expectations for the coming apocalypse. At his beck and call is a seven-strong supporting posse of co-conspirators including a soft-spoken spin doctor, a shady investment banker, armed field agents and assistant trio The Apocalettes, who manhandle participants with all the lightness of touch of ragged doomsday survivors. Doubling up in other roles at different stages of the show, the miscreant motley features performers like burlesque artist Miss Apple Tart (of The Late Night Shop Cabaret) and musical comic Paul Gannon. The stars of the evening, though, are undoubtedly the audience. Seduced by the absorbing farce around them, people volunteer themselves promptly and eagerly, investing visible energy into the games. One rushes to collect cans of food while chased by two actors clad as wolves. Another assumes a brave pose to fight invading aliens with the biological warfare weapon available to all humans: sneezes. Further stunts see blindfolded patrons defending vegetables against theft with a fly swat, or appeasing skinheads through the medium of song. Governing the pace of the evening is the ominous Wheel of Misfortune, which may point at anything from alien invasions to totalitarian takeovers. The enthusiasm of survivor wannabes, though, is not left to chance, but built at every step of the attraction. All ticket holders are required to fill in a form to establish their profile within a range from “Depressive Hedonist” to “Crisis Junkie”. Upon arrival, the player induction process continues with drills to prepare you for the many different games. Circumventing the imminent worldwide financial breakdown, Sinister’s minions exchange sterling pounds for a new legal tender of their own – the only currency accepted at the bar. 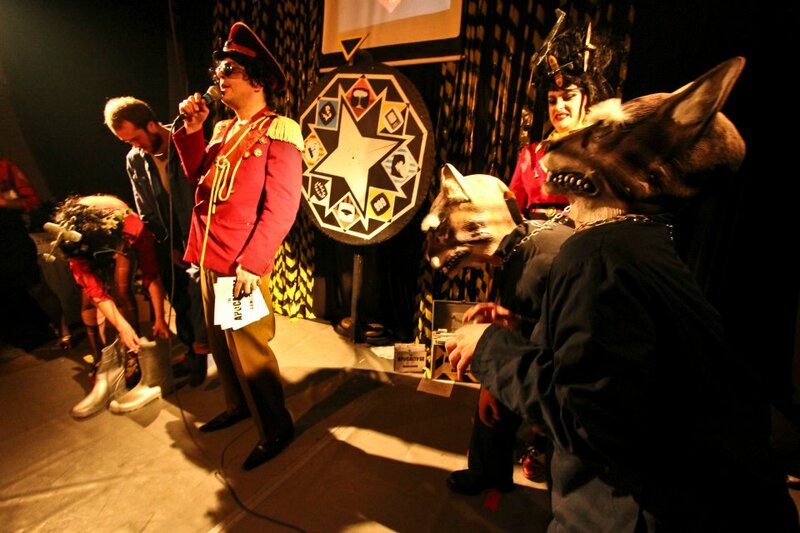 Nothing sets the mood for Armageddon like a Cold War vibe, and The Apocalypse Gameshow gets plenty of it from its venue. Moored at the King George V dock near Bascule Bridge in Southeast London, the Motorschiff Stubnitz is a genuine 1960s East German ship, converted into a party location that has been visiting different European countries since 1998. Its bare metal interiors and exposed machinery imprint unarguable credibility into the experience, which has previously played at the Pleasance Theatre and at secret locations around the capital. Audience interaction may be a cabaret staple, but you don’t often get an entire variety show built around the concept. On Dex Sinister’s decks, unexpected gags attack you from every angle. The Apocalypse Gameshow is an immersive joyride of heroic cynicism, addressing very real threats with deliriously current humour. Experts disagree on their predictions for the Second Coming, or when the chain reaction from the death of the last bee will turn Mad Max into non-fiction. These games of tongue-in-cheek fear mongering, however, are certainly an apocalypse worth preparing for. See ms.stubnitz.com for other events at the MS Stubnitz before the party pride of the DDR sails away from British shores.